Rialto Square Theatre and VenuWorks hosts the 25th Annual Rialto Square Theatre Wedding Expo, Sunday, August 12, 2018 from 11a to 4p. We are thrilled to host local vendors and future brides in one of the most spectacular venues in all of Chicagoland. The Wedding Expo gives us the opportunity to connect future brides with some of the most desired wedding vendors in the area, all while showing off the incredible Rialto Square Theatre. Join us for our 25th Year! Bridal parties know they can count on a first class affair, and we’ve been doing that for 25th years. 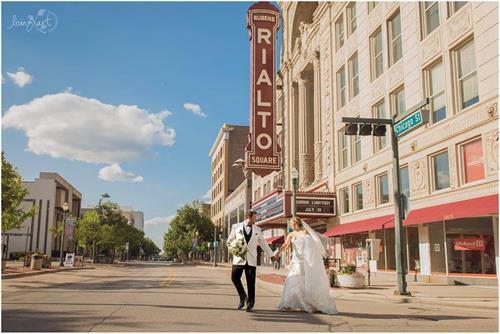 We offer the widest variety of everything you need to plan the wedding of your dreams – all at the beautiful Rialto Square Theatre. We provide a cost-effective, convenient presentation of wedding-related services while providing our attendees the finest selection of resources to plan the perfect wedding. $10 if you purchase your tickets ahead of time or $12 at the door.